Nokia N9 sure was the biggest star at Nokia Connection 2011. But it wasn't the only handset announced during the event. These include features that allow the user to personalize up to five SIM cards with a dedicated look and feel, and an Easy Swap option that lets users change SIM cards in seconds without having to turn off the phone or remove the battery. technology of the Nokia Browser, which can help keep costs of surfing low and speeds up page downloads. 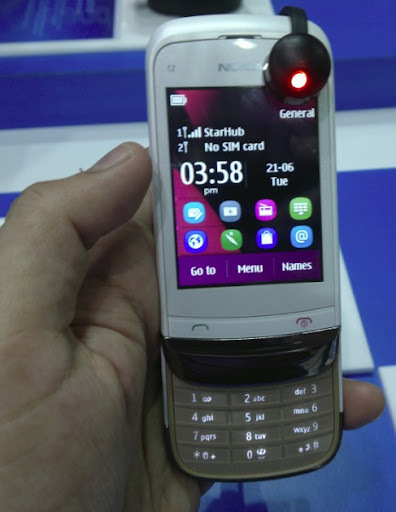 I got the chance to play with Nokia C2-03 at the CommunicAsia Nokia Booth. A true touch-and-type handset, Nokia C2-03 comes with both a slide-out alpha-numeric keypad and a resistive touchscreen. The browser loads with a localized start page, giving the user instant access to the most relevant content, and is tabbed to give easy access to favorite or previously viewed information. The estimated retail price of the Nokia C2-03 is USD 105 or roughly Php 4,550 with current conversion. The device is expected to hit the market in Q3 2011.
pwde din ba to magtext gamit lang yung touchscreen? or kailangan slide talaga?